Avocados are often thought of as a savory food, but I love making desserts with them, the creamy texture and mild flavor make a great combination with creamy desserts like ice cream and cheesecake. 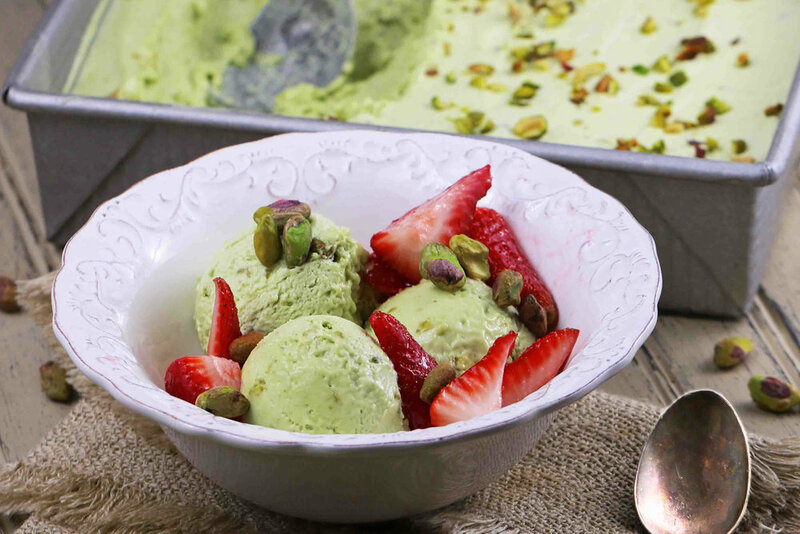 A hint of lemon juice in this recipe helps to offset the richness of flavor to make an ice cream which is truly unbelievable, serve with fresh strawberries for a taste that will intrigue and delight your friends and family. This easy no-churn ice cream is full of healthy fats so it’s a great way to boost your energy while having a treat at the same time. 1. Place the prepared avocado, lemon juice, Sola sweetener, and half of the cream into high powered blender. Blend on full power for 1 minute until completely smooth, remove from blender and place into large mixing bowl. 2. Whisk the remaining heavy cream to soft peaks and fold in the avocado mixture and chopped pistachios. Pour into a 10x10 inch square pan lined with baking parchment. 3. Place into the freezer and allow to freeze for at least 3 hours before serving. 4. Once frozen use an ice-cream scoop to dish up ice-cream and serve with fresh sliced strawberries.